Trip notes, transparent journalism and time travel – by Fiona Cullinan. There was my blank Google Q&A form sitting out there in a load of PR and tourist board inboxes. The idea was that it would act as a collection funnel for the incoming data – and keep it off my email. Answer: Google Docs went nuts. Over 48 hours, the online Q&A form filled up with 98 responses. The CEO of the African Travel and Tourism Association (ATTA) – spotted the callout on TravMedia and reposted the request to 400 association members across Africa. The PRs did all the hard work for me in preparing guide prices, product details, image sources and contact info. 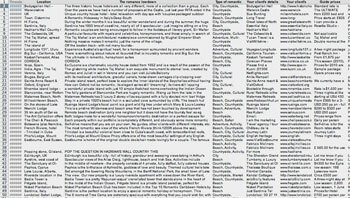 Nearly every question was answered by each PR and boxes were filled in – although many wrote an essay where the simple location was asked for, which stuffed up the spreadsheet layout. Reams of irrelevant material and spin were produced to make a generic place sound romantic rather than point out any actual romantic history, tradition or fact. Annoying although certainly not unexpected. There were a small number of bang-on-target suggestions, which were siphoned off into a UK and a worldwide file as per the commissions. Several places were suggested twice, eg the Taj Mahal. I ended up using both client details as I used information from both. I DID receive emails – but only nine (annoying but better than 98!). Three PRs ignored my form and emailed text such as a ‘nestled castle in a perched village’ or entire Valentine press releases (all ignored). Another emailed for clarification – subtext: was it worth her filling in the form? Some PRs experienced firewall issues and couldn’t access the form due to Websense, which blocks personal storage sites. Another emailed after the deadline had passed. And one filled in the form with out of date information – oops! Twitter feedback resulted in a few funnies but no major new ideas. It did have a supportive role when I had further queries, though – see part 3 for more on this. On the whole, it was a spectacularly good response, though. What did I learn from it? But there was also great value in rooting out knowledge I wouldn’t have found otherwise, such as being able to wear a suit of armour to propose at Warwick Castle or the location of the original ‘Horse Whisperer’ ranch. So I have to say to the PRs, a big thanks for taking the time to fill in the form rather than send generic press releases. For those faced with a Google form or journalist request, DON’T waste your time spinning your product to fit the journalist’s angle. Facts, evidence, relevance and concision are the things that stand out over pretty prose and just stating that something fits the bill. It took seven hours to plough through all 98 responses, and to copy and paste the potentials. Take out all the generic suggestions spun for romance and this could be reduced to just an hour or two. Ultimately, it was the chancing of so many sort-of relevant ideas that made the Google Docs/PR alert route financially unviable – shoving me frustratingly over time and therefore budget. Sourcing good pictures is also like entering a time warp. The pic research for each of the 10 blurbs was another tipping point. Free tourist board or PR pics are desirable and usually great quality. But traditionally writers haven’t had to source them – picture researchers have. Now, though, gallery features make popular editorial pieces and sourcing can be part of the commission package. Even with a media library log-in, or the PR contact for images, the resulting workload – the back and forth of emails, selection and zipping of images, collating and sending to the travel editor – soaked up another half day. Surfing for images on a stock library is faster but you can still while away many minutes looking for the right image to go with your copy. Ordinarily, this type of feature would take me 1.5 days to write, but the extra spreadsheet and picture sourcing brought this up to 2-3 days. So using Web 2.0 tools did make life easier but it also actually slowed down the work. The Google Docs sourcing experiment is not for every time – you have to be pretty dedicated to go through this process – and it’s probably not targeted enough for general themed features like these ones. It would probably work much better for my next list piece on great rail journeys. But I do think it is invaluable when you are stuck for inspiration and it takes only a couple of minutes to put together. It also throws up some great source material and new ideas. The likes of TravMedia and HARO offer a community of experts and the wisdom of the crowd. Statswise, in the end 6 out of 10 of the UK’s most romantic places were sourced from the Google Docs form; 8 out of 10 of the most romantic places worldwide feature were. To round off, I’m finishing this series by publishing the source material itself (the locations and romantic USPs only in order to keep it manageable and to keep individual PR’s emails and phone numbers private). Again I invite readers to compare the finished articles (UK and global) with the sourced material – would you have picked out the same list? I also invite the romantic among you to look for further inspiration and make your own selection from the list. Meanwhile, journalism students or wannabe travel writers are free to use the material to create their own travel feature from the material – – just leave a link to your stuff in the comments so I can see it.